Someone recently asked me, “What would you say to a woman who’s struggling in life or ministry and wondering, ‘Is God even calling me?’” Haven’t we all been in that place of uncertainty? I have. I’ve wrestled with the dark and doubt, the questions and insecurity. And here’s what I’ve come to believe: When we ask, “Is God calling me?” the answer is always, “Absolutely.” He is calling each and every one of us to Himself. That’s the calling we all share. Within that calling there will be things He asks us to do, steps of obedience He wants us to take. Whatever that is, we will never feel fully ready to do it. That is a good thing. Because it’s not about us. It’s about Him. Our brokenness, our weaknesses, and our failures are not enough to stop our unstoppable God. I am living proof that’s true. I imagine you are too. That’s why we need each other. As my friend and fellow writer Jennifer Watson says, “Don’t do it alone. The enemy wants to isolate us. Find at least one other person to partner with you. There is a reason Jesus sent His disciples out two by two.” Needing other people isn’t weakness; it’s wisdom. It’s the design God has always had in mind. P.S. If you liked this post, you might love You’re Made for a God-sized Dream: Opening the Door to All God Has for You. Want a preview of the book? Here’s a free excerpt. Love this thought. If we wait until we are “ready”, we may never act. We have God’s courage, grace and each other. That’s enough! “we will never feel fully ready to do it. That is a good thing. Because it’s not about us.” – Yes this is so true! I’m not good at showing people I need them. I wish I was, and I’m working on it, but it can be so hard. Grateful for grace. I’m so glad you said YES to His calling. Your writing is making a difference… and so is your speaking at retreats 🙂 Praying you keep saying YES to His offer of adventure. And it’s so great to remember that when we raise our hand to say, “Yes” to God there are others doing the same thing. We’re strong in Him together! I agree – Life was never meant to be done alone. This is such great encouragement, Holley. It made me think of the verse that says, “In the multitude of counselors there is safety.” We surely need each other so much as we try to navigate through this life. Thank you for encouraging me on my journey. I am being nudged out of my comfort zone lately. Someone is politely and with great care asking to be let into my mental inner sanctum where only God and I go. My usual answer when people try to be a part of my personal life is “it’s easier to be alone.” I am trying to consider allowing someone “in” so to speak. It’s very scary. I feel confident counting on God. I’m not so confident when it come to trusting people. Needing other people isn’t weakness; it’s wisdom. It’s the design God has always had in mind. Praying I can find the belief. Amen! 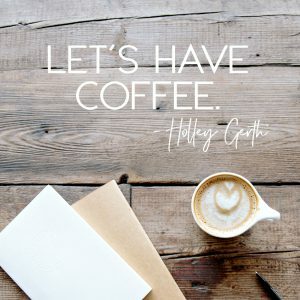 What a beautiful truth, Holley. Thanks for sharing this empowering and encouraging message today! I love that you are taking a stance to encourage community. It’s so needed! I’m right there alongside you in this. (Can’t wait to see what else God uses you to write on this topic). It’s so true, God is more concerned with WHO we are—the “what we do” will follow naturally from a heart filled with His love. I truly believe that God revealed to me, in the midst of coming face to face with a scientifically incurable connective tissue disorder that my destiny is not a position, a career, or a place…it’s the PERSON I’m becoming. She’s a daughter who’s both fragile and fierce and bears a striking resemblance to her Abba Father. Cheering for YOU and each of God’s daughters! Thank you so much, I really needed to read this today, right here and right now. Sometimes I forget… It’s good to be reminded!! Thank you for cheering us on, Holley, with your sweet humility and encouraging positivity. 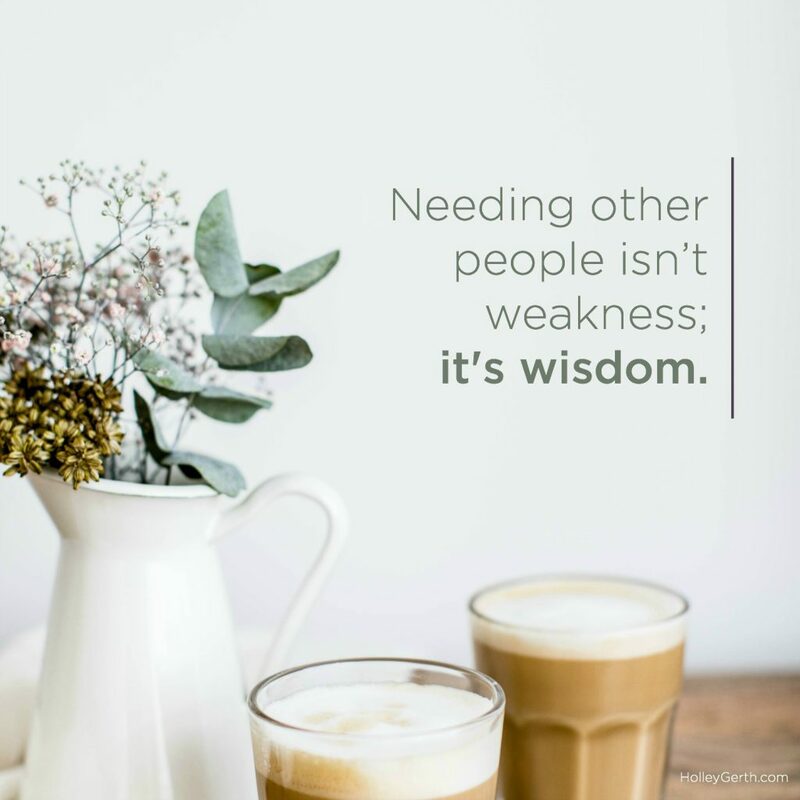 Today I especially appreciated the reminder that “needing other people isn’t weakness; it’s wisdom.” Too often we’re taken in by the lie that strong people don’t lean on others; that God should be our sufficiency. But, as you’ve pointed out, scripture doesn’t bear that out. King Solomon expressed it well: “Though one may be overpowered, two can defend themselves. A cord of three strands is not quickly broken” (Eccl. 4:12). In my discernment process when I think God might be calling me to a particular task, I pray about it. I know it’s “God’s work”, but the most helpful part of the process is asking myself “Does the prospect of embarking on this task energize me and make my creative juices start to flow, or does it drain me of energy and make me feel nervous, over-extended, or anxious?” Obviously I view the former as indicating that this is something that might well be God’s plan for me. I’m so grateful that God isn’t dependent upon our attitudes and readiness and skills! Thanks for the encouragement to press in, despite ourselves. You are right, God is calling us to do whatever he made us for. Everyone was put on this earth for a purpose, even though we may feel we can’t do it. God always choose the person who most people believe is the less likely the person for the job. I have often wondered if & how God could use me. Turns out all I had to do was find the right place & people. Tell them I’m available & watch God work. We must remember this: God doesn’t call the qualified He qualifies the called. He will show you how & when to do the tasks He has for you. Ephesians 2:10 For we are God’s handiwork, created in Christ Jesus to do good works, which God prepared in advance for us to do. Sure we may need help to achieve the task & that is good. Two working together is better than one alone!